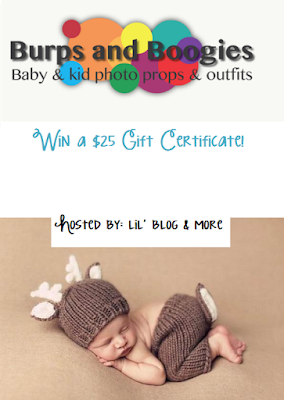 Welcome to the Burps and Boogies $25 Gift Certificate Giveaway! Thank you to the awesome sponsor of this giveaway: Burps and Boogies. Aren't baby props, so adorable? It's such a cute idea, and always helps parents get memorable pictures, for them to enjoy, for years and years to come. Surprisingly, they're affordable, too! Burps and Boogies has a great assortment, with great price points. The have wide varieties of costume props, shoes, blankets, wing props, and much more! 1 lucky winner will receive a $25 gift certificate to use at the Burps and Boogies website! Disclosure: The bloggers involved in this giveaway were not compensated, and are not responsible for prize fulfillment. Must be 18 years of age or older to enter this giveaway. This giveaway starts July 9th, 2016, and will end on July 31sst, 2016 at 11:59 pm. The winner will be emailed, and have 48 hours to respond, or a new winner will be chosen. Once a winner is drawn and confirmed, the name will be announced on the GiveawayTools form.